ANCHOR INTRO: Ohio farmers caught in the headlights of the recent Toledo water crisis are defending their voluntary efforts to reduce phosphorus run-off to Lake Erie. That runoff is the primary source of toxic algae blooms. 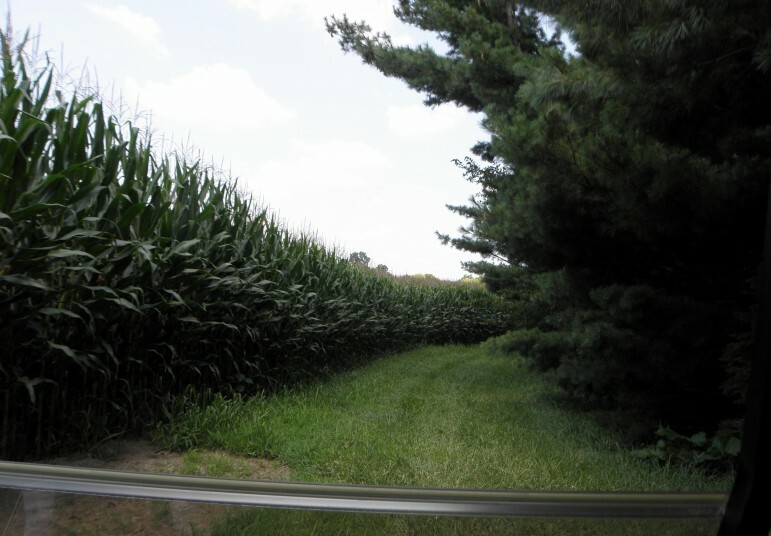 But Ohio farm groups and environmentalists say a new state law that will certify fertilizer use doesn’t go far – or fast – enough. For Great Lakes Echo, I’m Karen Schaefer. 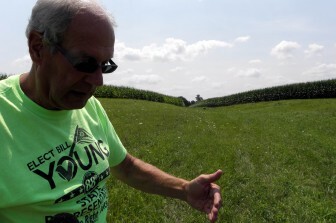 SCHAEFER: Bouncing along the edge of head-high corn fields in an electric golf cart, 65-year old, fourth-generation Ohio farmer Roger Wise is showing off grass-covered filter-strips that wind for miles along Wolf Creek, a small tributary of the Sandusky River less than 10-miles from Lake Erie. WISE: We have a buffer between the corn and the crick over there. There’s a lot of wildlife back here, It’s primarily wildlife and water retention and conservation. 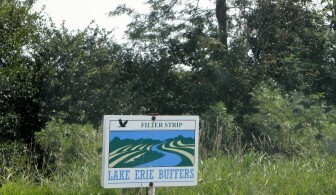 SCHAEFER: Filter strips, paid for by federal conservation programs, are just one way to help curb phosphorous run-off. Wise farms about 750-acres just south of Sandusky Bay, which like nearby Maumee Bay at Toledo, is plagued with toxic blue-green algae. Wise is thinking of adding a sluice gate to the end of the underground tile drains that help dry out his fields for spring planting. WISE: And that gate can be closed, which will stop the water flow at that box. SCHAEFER: Slowing the water during heavy rains is another way to reduce fertilizer runoff. Wise also employs GPS to map his fields, performs annual soil fertility tests, and uses cover crops like red clover to soak up excess nutrients. A past president of the Ohio Farmers Union, Wise says his agency has been educating farmers about the algae issues. What concerns him now is a loophole in the new state fertilizer certification law that exempts many large dairy, hog, and poultry farmers who spread manure on their fields. WISE: The original legislation was going to require that all the fields that were going to have the manure applied to, all the fields were going to be labeled, there was going to be a cropping plant and soil tests, and nutrient management — and all of that’s been done away with. SCHAEFER: Jack Shaner is deputy director of the Ohio Environmental Council. He says the new law requires only chemical fertilizer applicators to be certified, not those who use manure. And it doesn’t take effect until 2017. Shaner believes it’s time for more urgent farm regulation. SHANER: We need to put Lake Erie on a nutrient diet. It’s time to declare the western basin, the Maumee River watershed, a watershed in distress. It’s time to put a daily limit on pollutants that flow into that lake. Time to close the fertilizer applicator loophole and make sure that animal manure comes under that. SCHAEFER: Shaner wants to see a watershed-specific nutrient management plan for Lake Erie’s western basin. Agricultural scientist Andrew Ward of Ohio State University agrees. But he says fixing the agricultural practices behind Lake Erie’s algae problem won’t come cheap. WARD: We’re probably talking something like a hundred-million dollars a year would be needed in Ohio every year, for many, many years. SCHAEFER: However flawed, most critics agree that Ohio’s new fertilizer certification law is a baby step in the right direction toward more precise fertilizer management. Still, Roger Wise of the Ohio Farm sometimes likes to test for fertilizer use the old-fashioned way. 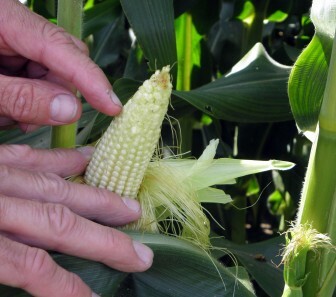 He peels back the husk on an ear of field corn. WISE: See here on the end, these will not develop. And that’s a good thing, because if every kernel was yellow right to the bitter end, that means there was more potential there. By having this little bit done, means we’ve maximized the yield, maximized the potential, done everything we should. SCHAEFER: But two other states in the Maumee basin are already regulating phosphorous run-off in ways Ohio is not. In Indiana, two recent state laws restrict the amount of phosphorus farmers may apply from manure or chemical fertilizers. And Michigan banned phosphorus in lawn fertilizers in 2010. Compare that with Ohio-based fertilizer giant Scotts’ voluntary removal of phosphorus from lawn care products in 2013. For Great Lakes Echo, I’m Karen Schaefer. The Ohio Sea Grant College Program of Ohio State University funded a series of five public radio features to be made available for free to public media across the Lake Erie basin. Ohio Sea Grant approved the grant application based solely on their criteria that stories included in the series focus on current challenges to Lake Erie’s health. Ohio Sea Grant has had and will have no oversight or editorial input on the specific content of those stories. Nor will they have any oversight or approval rights over changes to the story line-up. All stories are independently edited by professional public media journalists. This one was edited by Great Lakes Editor David Poulson. In every case, the highest NPR-style journalistic standards have been adhered to, in order to assure public radio stations and other public media outlets they need have no concerns over content quality. This story was updated 8/14 to correct the former title of Roger Wise. The biggest flaw in this law is it does not include manure..
Michigan has lots of cattle farming from Lake Erie up through Lake Huron, The breadbasket of Canada is Ontario, much more farmland along all the great lakes (except Lake Michigan). Detroit just had another huge sewage overflow. Ohio’s negative contribution is minor in comparison and we must not hurt our own the most. Besides that, Zebra mussels invasion is when the real problems started as they feed on beneficial algae in preference to the blue green (toxin producing) algae. Nature abhors a vacuum and the toxic ones fill the space just like a weed in the garden. Some sort of control genetically or otherwise needs to be found to either change their diet or reduce populations.